It’s not really fair to be mad at filmmakers for making a movie, but it’s the position I find myself in here. Not because Cabin in The Woods is a bad film, but because it’s a movie that’s almost impossible to review without spoiling pretty much every reason why you should go see it. I’ll give it a shot. 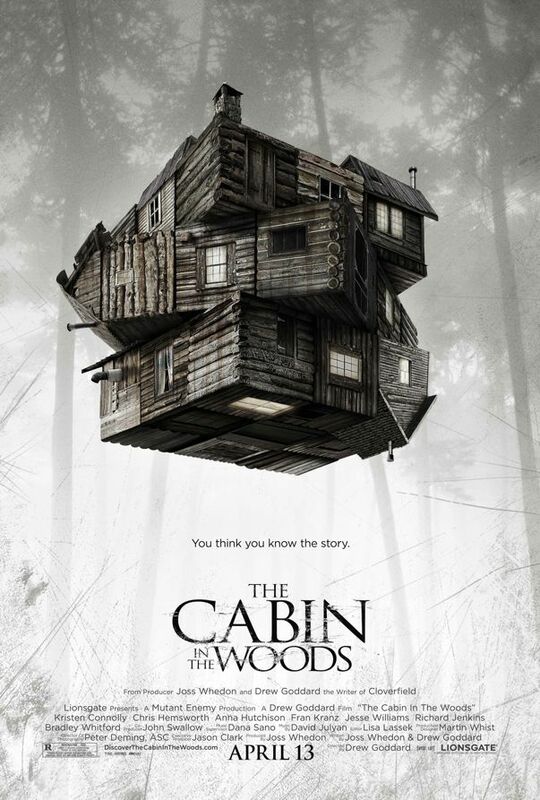 5 generic college students go visit a cabin in the woods, and then…Nope…I can’t do it. Although it’s fairly obvious from the trailers that this isn’t the generic teen horror movie it appears to be at first glance, it’s also a film that deserves to have its secrets experienced, not spoiled. This is a good script. This is a very good script. In fact, this is a script that anyone who loves American horror movies needs to study. Because like all of the best tributes, this is a script truly in love with its source material. This film isn’t mocking the mindless tropes of horror films, it’s honouring them. Not only that, but Drew Goddard and Joss Whedon’s strip does such a nice job of slowly dolling out tiny pieces of information through the entire film, that when it comes time for the lengthy “Here’s what in the Harper is actually going on” scene, it’s almost needless. We’ve figured it out, but just need a little bit of clarifying, which is then done quickly, with little wasted time. These are good characters. They verge on stereotype, with good reason. Horror is a genre that lends itself to stereotype incredibly well. We know that we need a goofball to keep the tone light. We know that we need a brainiac to help us figure out what’s going on. And we know that we need an innocent to rail against the forces of darkness. Not only does Cabin give us those clichés, it gives us a great reason as to WHY we need them….and it turns out we need them pretty badly. This is a fantastic premise. Unfortunately it’s a premise that I can’t tell you anything about. But it’s really good. It’s so good that you’ll kick yourself for not thinking of it first. It’s so strong, and so well-thought out, that’s it’s going to be hard to enjoy another film in the “cabin-in-the-woods” genre ever again. Anything I didn’t like? Sure. This was a genre juggle, and while I normally like that in my storytelling, I found the lack of pure horror to be somewhat anti-climactic. It’s a horror movie, but it’s rarely truly scary. And it’s also a comedy, though it’s rarely truly funny. It still combines both genres better than most films do, and as such is eminently watchable, despite the lack of real chills. Still, I found that I appreciated it more from a technical perspective than I did as a film that’s truly emotionally engaging. A quibble, but a quibble worth discussing. Cabin In the Wood is that rare scary movie that is smart, but also extremely accessible. It’s a fun horror film on its surface, with a terrifying secret at its centre that only enhances your enjoyment of the whole thing. This entry was posted in Movies and tagged Cabin In The Woods, Joss Whedon, Movies. Bookmark the permalink. Nice review, I would of had such a hard time explaining without spoiling the movie.